YouTube has denied making changes to its algorithms, after its most popular star said he would delete his channel. 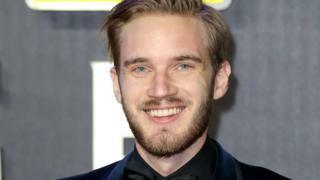 Video gamer Felix Kjellberg, known as PewDiePie, suggested changes to YouTube's algorithms had affected the discoverability of creators' content. On Tuesday, a Forbes report named the Swedish gamer who now lives in the UK as the highest-earning YouTuber. YouTube told the BBC it had not made any changes to its "suggested videos" algorithms. However, other video-makers have reported the same problem, with new videos being viewed fewer times than old content. The "suggested videos" feed appears when a video is being watched, and recommends more content to watch. Mr Kjellberg said the feed usually accounted for more than 30% of his video traffic, but in recent weeks it had suddenly fallen to under 1%, signalling an undisclosed algorithm change. Film-makers have argued that YouTube has made it more difficult for fans to keep track of their latest uploads, and for new viewers to discover their content, since the platform was acquired by Google. In a video uploaded on Friday, video gamer Mr Kjellberg said he would delete his channel when it reached 50 million subscribers as a result of his frustration with the platform. His channel, currently the most-followed on the video-sharing site, is about 200,000 subscribers short of that target. However, when asked by the BBC, YouTube denied that it had made any changes to its algorithms in recent months. It added that it had found no evidence that people were being unsubscribed from channels they followed. A spokeswoman said: "Some creators have expressed concerns around a drop in their subscriber numbers. "We've done an extensive review and found there have been no decreases in creators' subscriber numbers beyond what normally happens when viewers either unsubscribe from a creator's channel or when YouTube removes spammed subscribers." Mr Kjellberg is currently producing new episodes of his YouTube-financed series Scare PewDiePie, and on Tuesday topped Forbes' list of highest-paid YouTube stars for the second year in a row. His PewDiePie gaming channel is likely to reach 50 million subscribers in a matter of days. Mr Kjellberg suggested at that stage he would "start fresh" with a new channel, although some have taken his claim as light-hearted.